The Bernstein 121 Allegro is the type of piano that you can sit down and play and all your troubles of life just float away. The smooth touch of the keys, the beautiful contemporary sound and everything about this piano just flows. It is like hot chocolate on a cold winter’s day, it gives you a warm comfortable feeling as your fingers softly press down on the keys and the wonderful sound fills the room. It’s a feeling you will want to experience again, This piano is the one that spoke to me. The Bernstein Allegro offers superb European tone and enhanced tonal range in a medium sized cabinet. It is popular for demanding use in a smaller venue or room. The action is comfortable and responsive, ensuring you will want to play for hours. This 121cm model offers greater string length and soundboard area for improved dynamic response and power. Ideal for a serious student, player, school or institution. Has great tonal quality and range. Expressive piano that will allow the pianist to take piano playing seriously. Voted Best Selling Piano at a wholesalers Seminar in May 2009. 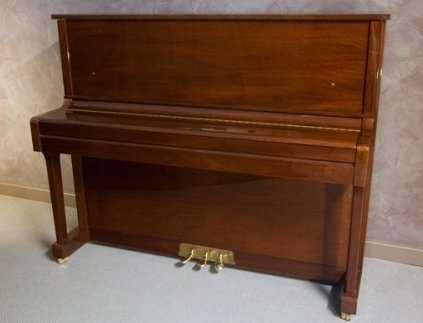 This 121cm Bernstein Allegro upright piano has to be the best value for money instrument. A powerful piano that has been purposely designed to meet the demands of serious students. Anyone playing this piano will enjoy its tonal quality and broad range.